If that ridiculous The Rock movie with the 30-foot flying wolf fighting other absurdly large animals got you thinking about genetic editing, John Oliver is here to break down everything you need to know about the potential (and pitfalls) of the science. 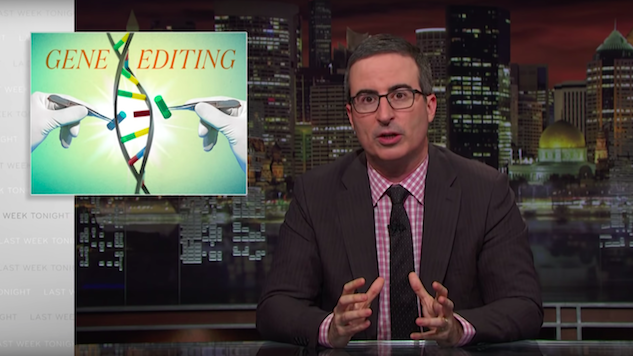 On Sunday night’s episode of Last Week Tonight, Oliver zeroed in on the real-life ramifications of developing procedures that essentially allow us to “cut and paste” DNA. While this could be groundbreaking, allowing us to eradicate certain types of diseases and keep them from being passed down hereditarily, it could also get out of hand and lead to, for instance, people drunkenly changing their genetic makeup. Most of the research so far has been done on plants and animals, leading to buff beagles, efforts to bring back extinct animals like the wooly mammoth and potentially ending the spread of Lyme disease, which as Oliver explains, often results from Tinder dates between ticks and dejected mice. However, since there is already at least one biohacker selling the technology used to do this out of his garage as if it’s some everyday high school chemistry set, Oliver is cautioning against us getting too excited about gene editing, urging us to remember that developing the procedures that could actually end diseases will take time and careful research to not ruin our ecosystems. From Rampage to unicorns, to yet another jab at China’s Winnie the Pooh-like president, Oliver was firing on all cylinders per usual this week. Check out the Last Week Tonight clip below.